ASIAN GRILLED SARDINES | YUM YUM PIGGY'S BUM...! These gorgeous little beauties with their glistening silvery skin are fantastic cooked on the barbecue when the sun is shining or grilled if the weather isn’t so good. Reacquainted myself with these fishy treats after eating a large plate of them on holiday in Spain where they’re much more highly regarded than in the UK. Think my boyfriend was a bit shocked at how much I adored them as I managed to polish off a whole plate of sardines! Normally I eat sardines from a tin but decided to hunt down some fresh ones. They’re very attractive, cheap and nutritious, the only downside is the number of bones to fiddle around with when eating them. If the sardines are small, you can eat most of the bones but not if they’re larger in size, have to take the spine out and cast aside the head and tail. As hadn’t cooked fresh sardines for a long time, used this recipe with awesome simple Asian ingredients with a few changes to make an easy flavoursome treat. Sardines lend themselves to strong Asian flavours as they are an oily fish with a proper “fishy” taste or are simply delicious cooked in oil seasoned with salt and lemon juice and fresh herbs. I served my sardines with a salad of roasted peppers and bulgar wheat dressed in olive oil and coriander, a sort of East meets West fusion dinner. Boiled/steamed Jasmine rice would be a suitable accompaniment with sardines too. Mix the ingredients of the dry rub together except for the oil. Place sardines on a tray and cover the fish with 1 tbsp of vegetable oil, sprinkle the dry rub onto the fish and rub gently on the skin and inside the cavities of the sardines. Leave to marinate for 10-15 mins. Start preparing the sauce by mixing all the ingredients together in a saucepan and heat gently for a few mins. Season as appropriate according to your personal taste such as adding more lime juice or fish sauce etc. Heat your griddle pan to a medium setting and oil the pan to minimise the fish sticking to the grill bars in your pan. Grill your fish for 5-7 mins on each side and they’re cooked when the skin turns crispy with the flesh coming off the bones easily. 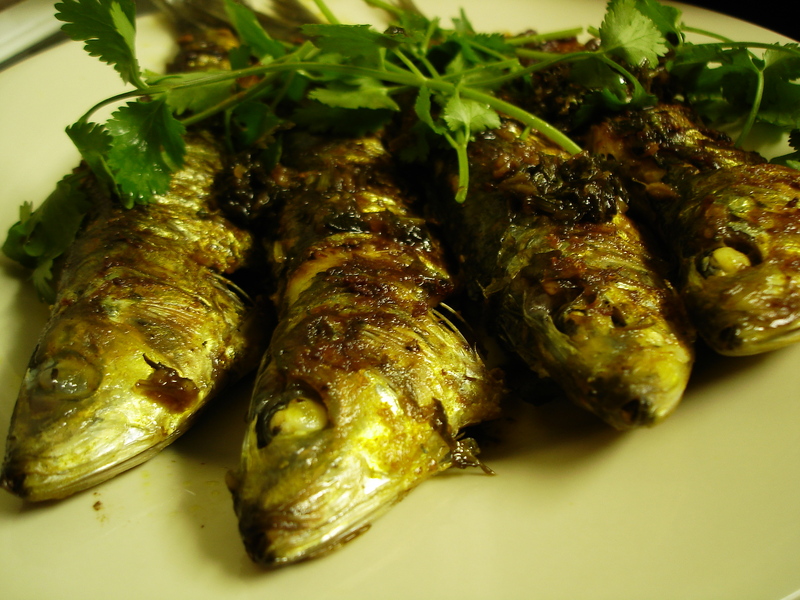 Serve the sardines on a warm plate, spoon the sauce over and add a few sprigs of coriander as a garnish.